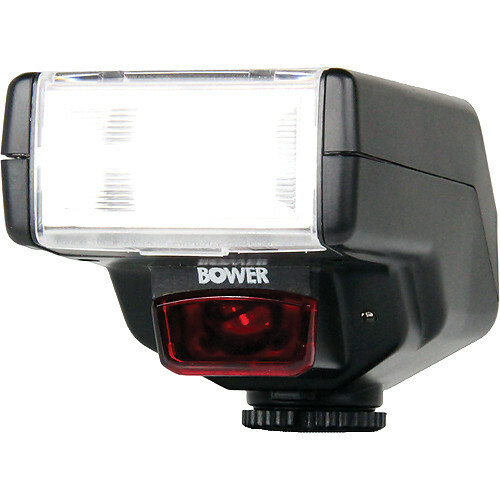 The SFD450C Illuminator Dedicated Flash from Bower is a dedicated E-TTL / E-TTL II flash for use with Canon digital SLR cameras. The Illuminator features a guide number of 108' at 100 ISO and a tilt head that operates from 0° to 90° as well as swivel of 120°. The flash covers an 18-55mm range (in 35mm/full frame format) and also offers red-eye reduction, automatic shutter speed setting, and rear curtain synchronization for shooting at slower shutter speeds. The SFD450C is powered by 4x easily found AA batteries. Box Dimensions (LxWxH) 5.2 x 3.5 x 3.3"
SFD450C Illuminator Dedicated Flash for Canon Cameras is rated 3.2 out of 5 by 13. Rated 4 out of 5 by Mud from Not a bad little flash for the money.... I ordered this before I read any reviews and they were all negative. When it came I made sure to save the boxes figuring I would need to send it back. What a surprise I got, I use it for macro and I have had absolutely no issues to this point. Yes it's not a top rated flash but it gets the job done, at times it's to strong for macro. I have two diffusers and have been shooting flowers, works great. The only con I have is that it's full time ttl and can only use exp/com via the camera. Other than that I am very pleased with this little gem. Rated 5 out of 5 by michael from Flashy Its bright. Ttl. Changes all angles. Great, cheap, made pretty well, and does the job. I bought a slave flash for extra blam blam. Ka pow. Rated 5 out of 5 by Daniel from illuminator dedicated flash for canon I have only been using my Bower flash for only a week and oh boy, am loving it. I used it to photographed a couple last sunday in seattle. I love how it very small and yet could produce such amazing light. My only problem was, I couldn't turn away the flash off my clients face and that was a little disappointing. Rated 1 out of 5 by Villages Shooter from Do not waset your money Product did not work out of the box, instruction were terrible but it is only $. Rated 4 out of 5 by Kas from okay? I use this with my t4i and it works pretty well. The flash is a little too bright, and I wish that I could lower the intensity of the flash, however, you just have to adjust the aperture and shutter speed. Will it control slave flashes? This will not control any slave flashes. Can I use it on canon t3i? Yes this will function and flash on your Canon G16. Yes, but I returned it because it was heavy and I didnt like it.